If DTC P0128 is displayed with DTC P0300, P0301, P0302, P0303 or P0304, first perform the trouble diagnosis for P0300, P0301, P0302, P0303 or P0304. Refer to EC-269, "DTC Logic". Engine coolant temperature has not risen enough to open the thermostat even though the engine has run long enough. This is due to a leak in the seal or the thermostat being stuck open. P0128 THERMSTAT FNCTN [Coolant thermostat (coolant temperature below thermostat regulating temperature)] The engine coolant temperature does not reach to specified temperature even though the engine has run long enough. Never refuel before and during the following procedure. Is the condition satisfied? YES >> GO TO 3. NO >> 1. Satisfy the condition. Drive the vehicle until the following condition is satisfied. Always drive vehicle at safe speed. Drive the vehicle under the conditions instructed below until the difference between вЂњCOOLANT TEMP/SвЂќ and вЂњFUEL T/TMP SEвЂќ becomes at least 26В°C (47В°F). Drive the vehicle at 50 km/h (32 MPH) or more with the difference between вЂњCOOLANT TEMP/SвЂќ and вЂњFUEL T/TMP SEвЂќ maintained at 26В°C (47В°F) or more. Keep the accelerator pedal as steady as possible during cruising. Drive the vehicle at 50 km/h (32 MPH) or more until вЂњCOOLANT TEMP/SвЂќ increases by 6В°C (11В°F). Is the condition satisfied? YES >> GO TO 4. Is 1st trip DTC detected? YES >> Proceed to EC-208, "Diagnosis Procedure". Check the engine coolant temperature sensor. Refer to EC-208, "Component Inspection". Check the thermostat. Refer to CO-21, "Removal and Installation of Thermostat". Disconnect engine coolant temperature sensor harness connector. Remove engine coolant temperature sensor. 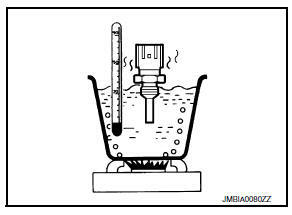 Check resistance between engine coolant temperature sensor terminals by heating with hot water as shown in the figure.